Seguimos sin saber si Lucy Hale forma parte del reparto de Stab o si será una de las muertes iniciales de Scream 4, pero ha sido entrevistada y se le ha preguntado sobre su papel. Ha dado pocos detalles: que solo estuvo en el set durante un par de días y que espera con impaciencia que se estrene. Alaba el trabajo de Wes. 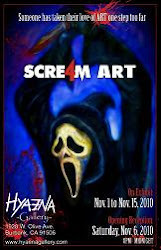 We still do not know if Lucy Hale is part of the cast of Stab or be one of the early deaths of Scream 4, but she has been interviewed and was asked about his role. She has given few details, that she was only on set for a couple of days and looks forward to be released. Commends the work of Wes.